I’ve been reading Walter Isaacson’s warm, affectionate biography, Einstein: His Life and Universe. I purchased a copy when the book first came out, but it sat on my shelf for a few years before I tackled it. Einstein’s popularity was, and remains, rather astonishing. He was, after all, a scientist. 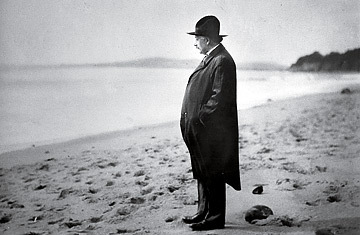 Before reading the book, I don’t think I fully appreciated how this man, this thinker, captured the public imagination. He became a bona-fide celebrity, a media darling who was often hounded by paparazzi. Think about that. These days, we’ve got Snooki and Charlie Sheen. 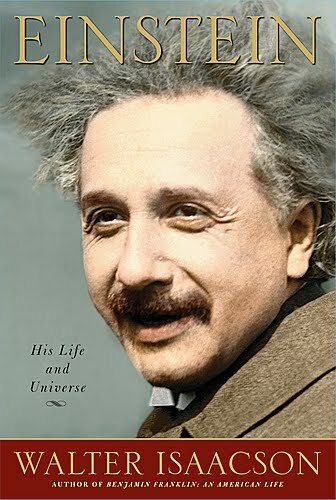 The book includes many photographs and, again, Einstein is simply one of those guys who never took a boring photograph. He’s like Keith Richards that way. Any picture with Einstein is interesting. Here’s one of my favorites, Einstein on the beach. Somebody should turn it into an opera. Oh, wait. He loved sailing, did you know that? Charming tales of him taking out the sailboat, drifting along all day, lost in reverie; more than once they had to send out the coast guard looking for him. After college, I worked in Washington, D.C., for a year. No, not as a state senator — I was a waiter at Beefsteak Charlie’s on K Street. 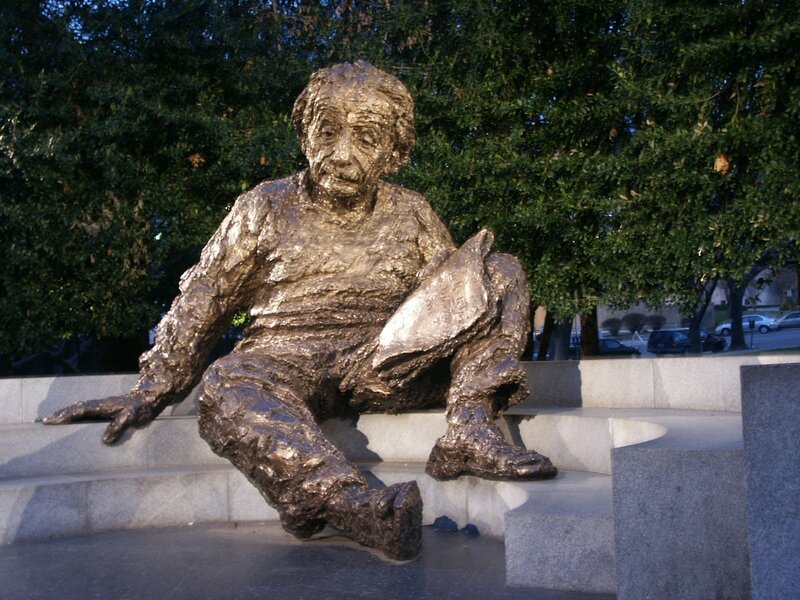 I think my favorite spot in the city was Einstein’s Memorial, a quiet spot missed by most tourists, not far from the Vietnam Veterans Memorial. The statue by Robert Berks is bronze, over 12 feet, and weighs more than 4 tons. I tried to lift it, but no go. Usually I just sat by his knee, enjoying the great man’s near company. But the best photo of Einstein does not even include him. 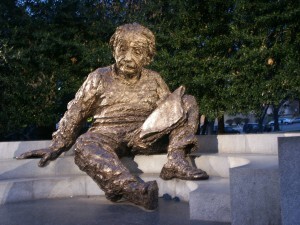 Einstein is absent, and yet wholly present. 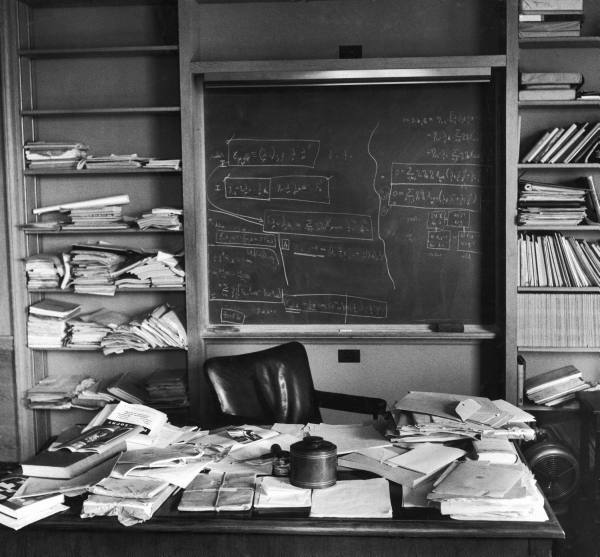 It’s the classic shot of his office in Princeton, New Jersey, taken by Ralph Morse for LIFE magazine on April 18, 1955, the day of Einstein’s death at age 76. Take a gander. What a glorious, cluttered, creative mess. A great mind at work. Don’t you feel better now? I should also comment that in the biography Isaacson does a marvelous job in giving us the whole man, not just the rumpled genius. Yet in rendering the whole man, Isaacson includes the science — in as straightforward and relatable way as possible. Still over my head, but when I jumped, I could almost touch Einstein’s stars. So a clean desk really is a sign of? A dirty mind? Isn’t that what they say?